Athletes choose different outdoor socks depending on their sport, so that they are perfectly suited to the different requirements and also to the corresponding outdoor shoes. That's why there are special socks for hikers, skiers, trail runners and cyclists, that perfectly suit their specific shoes and sporting activities. You can find a range of sizes and designs of men's, women's and kids' socks. Walking socks - These socks with medium strength padding are elastic and breathable. They have extra strengthening in the toe and heel regions and extend above the shaft of the walking boots. They guarantee great cushioning and a comfortable fit. 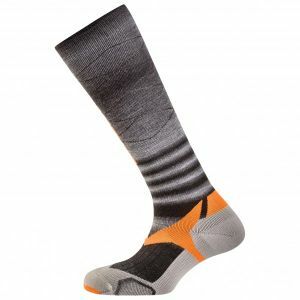 Trekking socks - They are cut higher than walking socks and are very well padded so that they are also comfortable for when you are carrying heavy walking backpacks. Running socks - Running socks are perfectly suited for wearing with light shoes for running or for the trail and ensure optimal moisture wicking during long, strenuous exercise. Ski socks - Elastic ski socks are reinforced in the shin area, so that they provide effective protection of the shin bones from pressure. With comfortable insulation they not only provide excellent comfort during skiing, but also keep your feet warm. Winter socks - These are similar to ski socks but with fewer special reinforcements. Winter socks ensure comfortably warm feet on winter hikes and excursions with snowshoes. 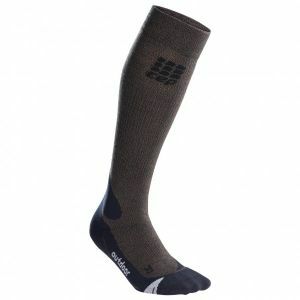 Cycling socks - MTB socks and cycling socks guarantee the perfect fit inside cycling shoes. Cycling socks are especially thin and close fitting while MTB socks are somewhat more cushioned and higher cut. Multi-function socks & sports socks - There are numerous varieties of sporty socks that don't slip and provide optimal moisture wicking. Sometimes they are styled as low ankle socks, sometimes in knee-length styles, these socks ensure high performance during outdoor sports and are comfortable to wear in sports' shoes or outdoor shoes. Experienced outdoor sock companies like Falke, Icebreaker, Smartwool or Rohner use various different materials in the production of their socks, to ensure a high level of robustness, good moisture wicking and a superb fit. Often they are also combined with high performance materials. Cotton socks - cotton is used above all in sports socks, cycling socks and multifunction socks. They are very robust and a offer a superb wear feel, but do have a long drying time. Merino wool socks - Merino wool in outdoor socks is not only very warm, but is also virtually odourless. The wool will keep you warm even in wet conditions. Synthetic fibre socks - socks made from synthetic fibres are often very robust and elastic. This ensures an outstanding fit, which won't loose it's shape even after countless washes. Socks in synthetic fabrics dry very fast and effectively wick moisture. Unfortunately synthetic socks are not odourless like Merino wool socks. Socks in mixed fabric - In order to combine the positive attributes of different materials, mixed fabrics are often used in the manufacture of outdoor socks. Blends of robust and elastic synthetic fibres with premium Merino wool are very popular and efficient. This means that it's possible to produce socks, which keep their shape for longer and are virtually odourless, meaning that they offer a superb and comfortable fit. Some socks fulfil particular purposes in the outdoor world and there are a variety of different recommended uses for the different materials. Compression socks - runners, trail runners and road cyclists use tight fitting compression socks for optimal blood circulation in the legs. Waterproof socks - Equipped with special waterproof and breathable membranes, these waterproof socks are suitable for use in many outdoor sports and guarantee dry feet even in the worst rain. Toe socks - Toe socks create a very different feeling, and not just when you combine them with toe shoes. In toes socks every single toe has it's own comfortable place. But some people do need a little time to get used to the different wear feel.